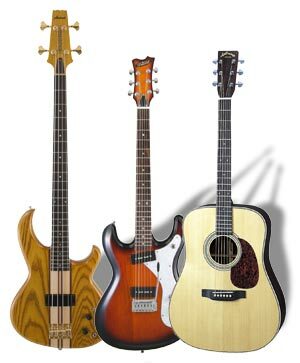 For over 50 years, the legendary Aria Guitars company has been producing guitars and basses, electric and acoustic, for a worldwide audience.Today we see this long-term commitment reflected in an incredible range of available gear, from cost-effective starter guitars to upscale Made-in-Japan handcrafted instruments.Some lines, like the Sinsonido guitars, are relatively new and groundbreaking, some are as conventional as the people who play and crave them. And some have become standards in their own right, having been in production for decades, like the PE solidbody series.As many famous bass players like John Taylor, Cliff Burton and Chuck Rainey have shown; Aria guitars are out there competing with the best of them. And not just basses, either! An Aria Dreadnought in the hands of Steve Stevens can work miracles. As can Nokie Edwards and Herb Ellis on their electric guitars. Go out and discover what you and your Aria guitar can achieve!